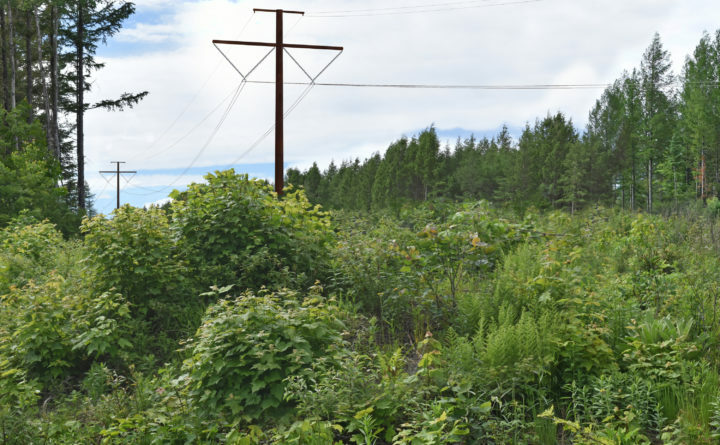 The lattice towers Central Maine Power said it is proposing for its New England Clean Energy Connect hydropower line from Canada to Lewiston. This image, looking northwest from Wilson Hill Road in West Forks Plantation toward the proposed transmission line, also contains a photosimulation of five years of vegetation growth that is 10 feet or less in height. A town of 68 residents along the proposed hydropower corridor from Canada to Lewiston retracted its earlier letter of support for the Central Maine Power and Hydro-Quebec project, calling it harmful and saying it is not financially beneficial to the Maine economy or its residents. In an Aug. 31 public comment letter to the Maine Public Utilities Commission, Elizabeth Caruso, chair of Caratunk’s selectboard, asked commissioners, the Maine Department of Environmental Protection, the Maine Land Use Planning Commission and the Massachusetts Department of Public Utilities not to allow the New England Clean Energy Connect, or NECEC, project to go forward. Caruso also is expected to participate Friday in the second consecutive day of technical discussions about the case this week. Additional discussions will take place Sept. 14. Caratunk is one of the towns along the NECEC route that earlier signed letters supporting the project. New Sharon is the only one that did not sign a letter, according to CMP spokesman John Carroll. Caruso said Caratunk residents had second thoughts after comparing the benefits touted by CMP, including property tax benefits, with what Caratunk might lose, including not being able to build a solar array Caruso said would bring in more property tax revenue than she expects from the NECEC infrastructure. “We have grave concerns for the welfare of the citizens and ratepayers should this project be brought to fruition,” Caruso told the Bangor Daily News. A Maine Center for Business and Economic Research report prepared as part of CMP’s project submission to the PUC lists scenarios for new taxes for the project. Caratunk, which has a current property tax rate of $7.20 per $1,000 valuation, would have an adjusted rate of $5.21 under the NECEC new valuation, giving it $100,487 in projected new tax revenue annually. The total amount cited in the report for the $950 million NECEC project is $18.38 million in new property tax revenue for the towns, unorganized territory and townships along the route. Lewiston, which would have the most new infrastructure in the project, would get the most: $8.39 million. Caruso cites 10 issues of concern in her letter, including the valuation benefit of a possible new solar farm. “Caratunk has already twice supported NextEra for a solar farm within its boundaries,” she wrote. “This DC [hydropower] line blocks access to solar or other energy projects in Caratunk and Somerset County. One such solar project lost [is] in direct competition to this NECEC. She also began to question CMP’s tax revenue numbers after a discussion with town assessor Garnett Robinson. Robinson was an assessor in Dixmont during an earlier large CMP project, the $1.4 billion Maine Power Reliability Program, an expansion program with construction starting in 2010 and ending in 2015. He said when CMP applied for a permit to put lines through Dixmont in 2009, it estimated the value of the project at $24 million. But once the project was completed, CMP valued it at $8 million. The result, he said, is less tax money flowing into the town. Caruso asked in her PUC letter to be represented in permitting decisions. “As this case progresses, more information becomes known,” said Tanya Bodell, executive director of Energyzt, a Boston consultancy. She is an economist testifying as an intervenor at the PUC on Friday. CMP’s Carroll said he is disappointed that Caratunk withdrew its support. He has requested a meeting with the town to clarify what he said are misunderstandings in the letter submitted to the PUC. Nothing has been set up yet. He also said the small plantation of West Forks plans to hold a meeting of townspeople next week to vote about whether or not they support the project. A West Forks selectman was not immediately available for comment. Carroll said the NECEC project is not blocking Caratunk from building a solar array. He said Caratunk still can build the solar array. It will have to find a different customer for the energy from it. Carroll said it still could be a few years until the Maine Revenue Service, CMP and the towns agree upon exactly how the tax benefit of the NECEC project would be distributed. The Maine Power Reliability Program was paid for mostly by CMP and in turn, by ratepayers. Carroll said the tax benefits from the project were socialized, or spread across all the ratepayer areas that benefited from it. “It was built for CMP ratepayers who shared equally in its value,” he said of the difference between the permit value and the finished project value. Since Massachusetts taxpayers are footing the bill for the transmission project, the distribution of tax benefits still has to be decided in Maine, he said. The Maine Center for Business and Economic Research report’s new property figures were estimates. The proposed project still needs to be approved by the Massachusetts Department of Public Utilities and the PUC. The PUC will hold a series of meetings about the project through the fall. There will be a series of hearings Sept. 18-21. An important document that summarizes the case and gives PUC examiners’ recommendations is due out Nov. 9. Responses to that will be heard Nov. 16. The PUC commissioners are scheduled to deliberate the case Nov. 27. The controversial project has drawn 285 filings, 74 data requests and 300 public comments to the PUC’s website. Follow the Bangor Daily News business news on Twitter: @BDNbiz.